This beautiful icon of the Panagia Hodegetria or All-Pure Directress shows the Virgin Mother Mary guiding our attention to Her Son and God by indicating with her hand that He is the “Way, the Truth, and the Life” for our salvation. In the upper right and left corners respectively are the Archangels Gabriel and Michael watching over the holy scene with awe, reverence, and love. 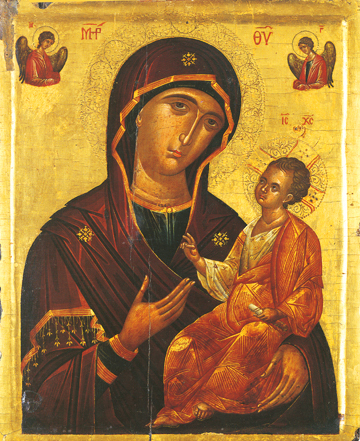 In this and in most icons of the Hodegetria, the Virgin slightly inclines her head towards her Son and, although she expresses tenderness, her face is also serious and sorrowful as she looks directly at us. St. Symeon the Righteous Elder predicted that her heart would be pierced with sorrow, and this came to pass especially at the time of His Passion, rejection by the Elders, and Death on the Cross. The haloes over the heads of the Virgin and Child are delicate and have a floral style, which is indicative of the techniques used by the Cretan iconographer Andreas Ritzos in the third quarter of the 15th century, and was probably either made by him, or in his workshops, or patterned closely after his style which hearkens back to the late Paleologean period of Byzantine iconography.